Carl Wenning is a sly old bugger. He’s got a crafty glint in his eye and I know why. 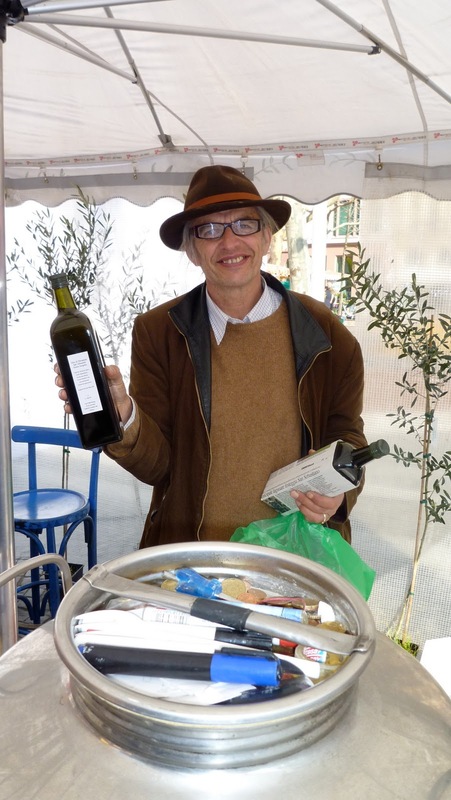 He’s back on the market in Mainz, dressed like a gentleman farmer (in real life, he’s an architect and engineer) with his excellent extra virgin (HT to Leif) olive oil from the 220 olive trees that are as old as the hills, if not Methuselah and are probably mentioned in the Old Testament. He’s developed this air of scarcity by only fronting up 4 times a year and spinning this yarn about the 220 olive trees wuggawuggawugga and the gullibles like me swallow it hook line and sinker. You can’t say that he’s extravagantly expensive at €23 a litre, either. But if you read the small print, it now says that the demand from the tribe that he’s built up means that his limited production gets sucked up before the year’s over. He’s not actually saying that he’s blending theirs with his. 19 Apr	This entry was published on 19 April, 2010 at 11:00. It’s filed under Mainz and tagged carl wenning, Market, olive oil. Bookmark the permalink. Follow any comments here with the RSS feed for this post. >Glad I read it. At first glance I was thinkng "Snake Oil"!I"ve always marveled at the term extra virgin. A virgin with a little something extra??? >Of COURSE it's extra virgin. Does anybody use anything else…? >But is the olive oil EXTRA VIRGIN? That's what you should ask! >Good olive oil is a real treasure.